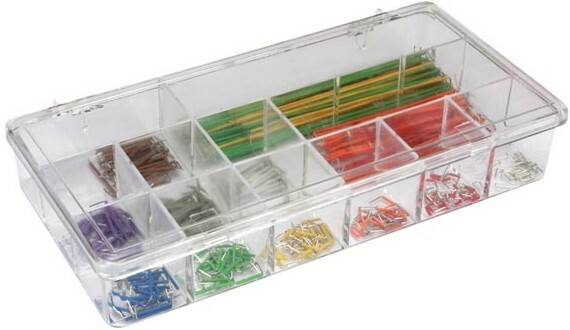 A kit containing suitable interconnecting wires for use with all of our solderless breadboards. The leads are colour coded with PVC insulation and have preformed ends ready for use. There are 14 different lengths: 0.1, 0.2, 0.3, 0.4, 0.5, 0.6, 0.7, 0.8, 0.9, 1, 2, 3, 4 & 5 inch. and this kit has 25 of each. Supplied in a handy plastic reusable case.